If you love Gucci bags, it can be helpful to know the basics of how to distinguish a real one from a fake. While it's not always easy to spot the differences, you can arm yourself with the knowledge you need to authenticate a Gucci bag. Although selling anything that's counterfeit is illegal in the US, it does happen, probably more than many people realize. Some counterfeits look very similar to the real thing, but that's not always the case. So start by looking at the workmanship. 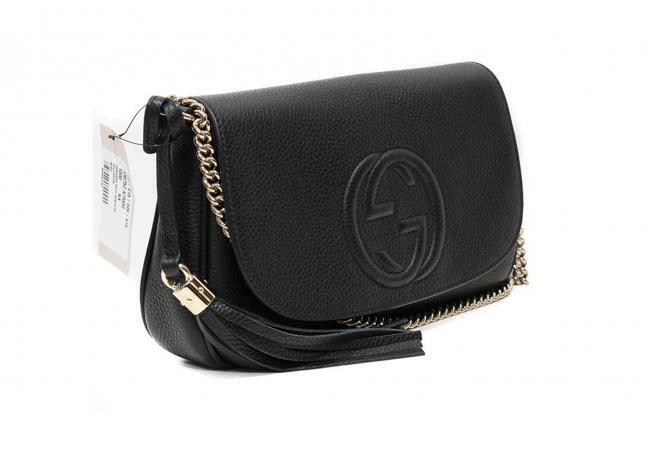 With genuine Gucci bags, the stitching is usually tighter and more even, the hardware fits more snugly and evenly, and the material is solid and heavy. Bottom line: The real deal just looks and feels like better quality. There are four other areas where you can spot differences between real and fake Gucci handbags. 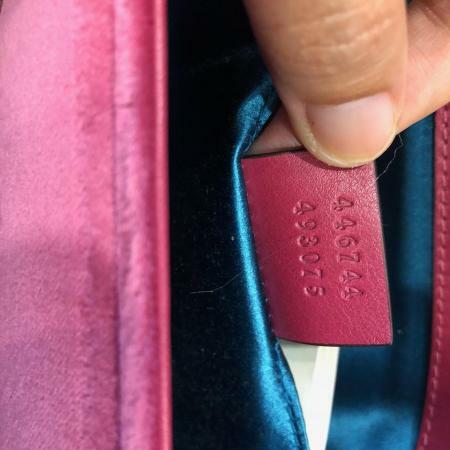 One of the great things about Gucci bags is the level of detail in each one, the fabric or leather, the hardware, and the tag with serial number. Each of these has the potential either to allay or confirm your suspicion that it could be a fake. Looking closely at some of the elements within the leather or fabric of the bag can help verify its authenticity. Canvas is the most common fabric for Gucci handbags, and that's where you can find clues to the bag's authenticity. The Gs should face each other, with the lefthand G facing to the right and the righthand G facing to the left. When this is replicated incorrectly, it is easy to spot. The serifs of the Gs should be long and elegant. The part that extends into the G should be longer than the part that extends toward the opposite G. They should not be blurry. They also should not look modern or too chunky, but rather slim and elegant. Whether with canvas or coated canvas, the logo will be well defined and even, not blurry or ill-defined. Other elements of the fabric come into play as well. There are always two well-defined diamond-shape "dots" between each pair of interlocking Gs. Some counterfeit bags will do this incorrectly. For example, they might have more or less than two, or the dots might be touching or too far apart. This pattern should be woven into the fabric, not printed on it. This should not be confused with the Gucci fabric that is just diamond dots and no Gs. The fabric of monogram canvas bags is rougher even though it softens over time. Many counterfeit bags will have hardware that is an immediate giveaway, since it may be lightweight, hollow-feeling, tarnished, peeling, or flaking. By contrast, Gucci hardware is sturdy and weighty. Much of the hardware will be engraved with the name "Gucci," and if it is, the engraving will be clean and neat, not blurry or uneven. The zipper pull will be made out of the same material, canvas or leather, as the rest of the bag. 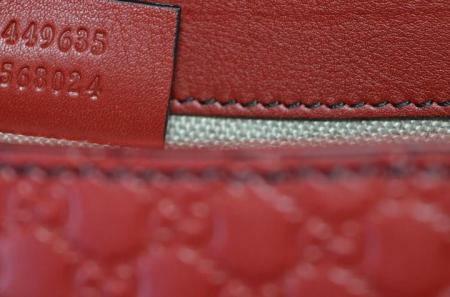 The zipper will be metal, never plastic, and in newer bags will be engraved with the Gucci logo on its underside. In addition, as of 2016, there has been an important change to brand. A new designer has updated the logo so that they are no longer interlocking, they are overlapping. You'll still see the interlocking logo on the canvas and leather, but a bigger logo on the clasp, for instance, will look different. The new G is sleeker and the top opening is more pointed. In addition to the new G logo, sometimes you'll see a textured tiger head closure instead of the Gs, a stylized buckle, or another design element. The serial number tag is considered by many to be the best way to distinguish real from fake. 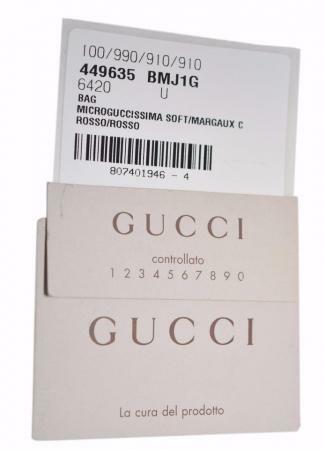 The Gucci serial number is typically located on a leather patch sewn at its top to the inside of the bag; it is not sewn down on all sides. The tag should be a square, or a slight vertical rectangle. Bags from the 1990s were slightly rounded at the bottom, and some of their details are a little different. The trademark symbol is missing, and instead of being all lowercase, the words "made in Italy" are all uppercase. The word "Gucci" looks just the same. The words "made in Italy" at the bottom. The words are all lowercase and in the same font as the name of the company just above it. The G is very round; if the line continued, it almost forms an O. The serifs on the G are equal, unlike the interlocking Gs. The two sides of the U are different; the left side is thick and the right side is thin. The Cs are very round, like the G.
The font of the numbers is dainty; any numbers that look too straight or modern are from a fake bag. With new bags, the serial number will be two rows, one over the other, and there will not be letters in the serial number. The format varies in vintage bags and might include periods or hyphens. The numbers will not necessarily line up perfectly. The vagaries of craftsmanship, the difficulty of embossing pigskin, which some of the bags are, and other factors mean that the numbers will appear a little unevenly lined up. Finally, you can use the serial number to help you weed out suspicious bags. The number will be made up of two rows. Unfortunately, there doesn't seem to be consensus about what the numbers mean, but experts suggest that the top row may be the style number, and the bottom number may be a supplier or production code. The total number of digits will be between 10 and 13. Authentic Gucci bags come with specific packaging. They will never be wrapped in plastic; that would be a sure sign of a counterfeit bag. They do come with dustbags, the colors of which have varied over the years. These bags are either dark or light brown or black. Many online sources point to the controllato card, white in older ones and off white in newer ones, as proof that a Gucci bag is genuine. "Controllato" means "checked" in Italian, and it is proof that the bag went through the quality control process. The card reads Gucci and Controllato and underneath are the numbers 1 2 3 4 5 6 7 8 9 0. There are two problems with using the card to tell you something about your bag. First, the card can be moved from one bag to another, since it is totally separate from the bag itself. Second, a card can get lost. Therefore, just because your bag doesn't have a card doesn't mean you should automatically dismiss it as being a fake. In addition to the controllato card, there is also the information card. This, too, can get separated from the bag or produced by counterfeiters, so one that doesn't look right (for instance, the logo is incorrect) can be used to show that a bag is counterfeit. The lack of these cards can't be used to show that a bag is not genuine. New bags also have a label on the inside of the bag with a QR code on it. Quality. Like the modern bags, a genuine vintage bag will always have high quality hardware, stitching, and materials. Inferior quality workmanship likely signals a counterfeit. The logo. The logo wasn't always the interlocking G logo, which was introduced in the early 1960s. The serial number. Some older bags don't have a serial number, some have double-digit numbers, and some don't have one at all. 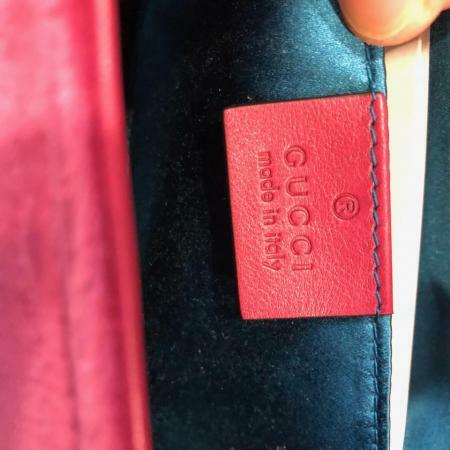 If you don't have the bag in hand and are buying your Gucci bag online but not from a major department store or the Gucci site, make sure to ask for and get many high-quality photos. Some of these photos need to be close-ups, so you can see the details. Handbag experts are able to authenticate bags from photos and just a few pieces of information; if the photos are good enough, and you know what to look for, you'll be able to as well. You can find help online if you find a bag you're interested in but, even armed with your understanding of authenticating Gucci bags, are just not certain is real. As an alternative, you might want to pay a small fee and get your bag authenticated through one of the companies that provides this service, such as Authentication First, Real Authentication, Luxury Exchange, and My Poupette. At some places, such as Real Authentication, their experts specialize in particular brands and have many hours of experience seeing and handling them. Occasionally, even they may take a few hours to authenticate a bag, says one of their experts. Some, like My Poupette, also recommend trustworthy resellers of Gucci bags, so you don't have to rely solely on your newly acquired authentication skills. If you do wind up the unlucky owner of a fake Gucci bag, you do have recourse. Contact an authentication company and get official proof it's a counterfeit. It could help you get your money back from the seller or even your credit card company. Knowing the details about a Gucci bag, and what to look closely for when buying one, can help you make a purchase you can feel confident about. Whether you're looking at a secondhand style, or a new one in-store or online, you can be prepared to get an authentic handbag.